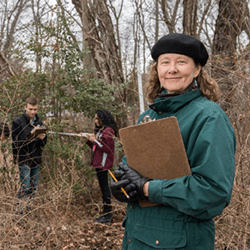 Janet Morrison conducts field research with undergraduates. The College is pleased to announce that Dr. Janet Morrison, professor of biology, has been recommended as the inaugural recipient of the Barbara Meyers Pelson ’59 Chair in Faculty-Student Engagement. Morrison is a nationally recognized authority on mentored undergraduate research, and her proposal will lead to growing and strengthening TCNJ’s efforts in faculty-student engagement across the campus, in all schools.